ipHouse // How do they work? In a nutshell, VMware allocates the resources from physical hardware among multiple operating system installations (Virtual Machines). VMware manages physical hardware resources by analyzing the balancing of individual computing demands versus the entire resource availability. To do this, VMware is installed on a group of physical servers (a cluster) and VMware then creates resource pools from the CPU, memory, and storage. Prior to your operating system installation, a virtual machine is created using CPU, memory, and storage allocated from the resource pools. Your operating system in then installed on the virtual machine. 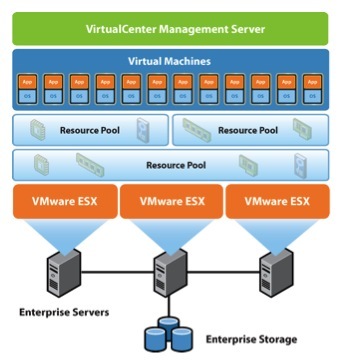 VMware divides the physical cluster into resource pools allowing the dynamic allocation of resources to the virtual machines. VMware's Dynamic Resource Scheduling analyzes CPU and memory utilization, redistributing processing demand across multiple servers transparently. Dynamic Resource Scheduling ensures that your server always get the resources it requires. VMware takes advantage of our clustered hardware and provides automatic physical server balancing and high availability for your Virtual Server. As an Enterprise VMware Service Provider Partner, ipHouse has the knowledge and licensing to provide you with the virtualization solution that is right for your business.